Do you want your students to engage actively in disciplinary practices? Do you want them to feel more confident in their skills as scientists and social scientists? Do you want to help develop inquisitive lifelong learners? Course-based undergraduate research experiences (CUREs) provide students the opportunity to engage in research experiences that cultivate their investigative skills, sense of discovery, and interest in the field. All faculty have the qualifications to be successful at developing and teaching CUREs - namely the ability to deal with uncertainty in a research environment, expertise in the area, and time to invest in the process (Shortlidge, Bangera, & Brownell, 2016). In this newsletter, we present the characteristics of CUREs, list benefits to students and faculty, and suggest steps for how to begin developing a course with CURE elements. We also highlight resources for instructors interested in designing or modifying a course to incorporate research as part of the Brown Learning Collaborative. A growing body of evidence shows that undergraduate science students, especially women and underrepresented minorities, benefit from research experiences (Auchincloss et al., 2014; Russell, Hancock, & McCullough, 2007; Linn, Palmer, Baranger, Gerard, & Stone, 2015). However, 1:1 mentored research opportunities are, by nature, limited by faculty availability and/or financial resources. One approach to increasing student access to research is through course-based undergraduate research experiences (CUREs), which can accommodate more participants and mitigate barriers associated with traditional research mentorship models (Bangera, Brownell, & Hatfull, 2014). Use of disciplinary practices - students learn disciplinary practices by engaging in authentic research. Discovery of an unknown outcome - students use data to arrive at an answer that is unknown to both students and instructor. Broadly relevant research - students conduct research that has relevance to a broader community (e.g. scientific or local community). Collaboration - students work cooperatively to answer research questions. Iteration - students go through cycles of experimentation and learn to move past failures. 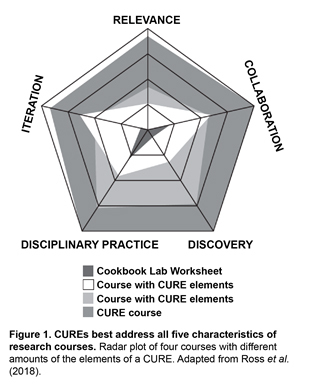 As with most teaching practices, the five characteristic of the CURE model can be modified to fit a current course or used to develop a new course (Figure 1). Why Should I Teach a CURE? CURE courses can provide many of the same benefits as mentored research but to a larger number of students. In this way they make research more inclusive by making research experiences more accessible to a greater diversity of students (Bangera, Brownell, & Hatfull, 2014). As with trying any teaching innovation, there are challenges that faculty face while designing and implementing CUREs. Commonly reported challenges are logistics and the upfront time commitment (Shortlidge, Bangera, & Brownell, 2016). To mitigate some of the challenges, Brown-HHMI and the Sheridan Center are co-sponsoring a CURE Seminar Series focused on bringing interested faculty together with CURE experts to learn about the development and implementation process (see below). One goal of this learning community is to help alleviate the time and work investment associated with CUREs cited by the authors. Find collaborators - Research is rarely conducted alone, so reach out to others to collaborate with you. This could be other instructors in your department, community members, or local institutions. For example, Everett Community College worked with the Washington Department of Ecology to characterize water systems (Kveven, 2018). Reflect on effective teaching practices - Think about teaching practices you already implement that align with the CURE model. Are there other instructors you could learn from or talk with about teaching? You could join in Open Classroom Weeks to see an example of a CURE at Brown, Phage Hunters. The Sheridan Center also offers consultations if you’d like to further discuss your teaching practices. Identify a local, relevant, or interesting project - A project could come from talking with collaborators, transfering a part of your own research to the classroom, or focus on a timely topic that you want to use as a vehicle to help students learn disciplinary skills. An example of a local, relevant collaboration is St. Edward’s University where students worked with the city of Austin, Austin Youth River Watch, and the Lower Colorado River authority to provide information about how the urbanization of Austin affected water quality using a particular method and piece of equipment (Hooser, Bilinski, & Baynham, 2018). Develop assessment measures that incorporate reflection - CURE courses ask students to engage in disciplinary practices in an iterative and collaborative way. As such, be creative in the way you think about assessing student understanding and skills. You may include metacognitive, or reflective assignments (examples of these can be found in the Sheridan resource, Promoting Metacognition), group evaluations, and assessment of student troubleshooting skills. Please also see this CURE syllabus template to help design your own course. Brown-HHMI and the Sheridan Center are co-sponsoring a Fall 2018 Seminar Series and one-day course design institute oriented to any faculty who wish to redesign a course, or module within a course, to incorporate undergraduate research. Successful proposals can receive up to $35,000 in funding. (A second call for proposals will be issued in early Spring Term 2019.) The Sheridan Center also offers a Spring '19 course (UNIV 1110) to undergraduates to prepare them to be Research Fellows in CURE environments. For more information about any of these opportunities, please email [email protected]. Subscribe to the Sheridan Center newsletter. Auchincloss, L. C., Laursen, S. L., Branchaw, J. L., Eagan, K., Graham, M., Hanauer, D. I., … Dolan, E. L. (2014). Assessment of course-based undergraduate research experiences: A meeting report. CBE Life Sciences Education, 13(1), 29-40. doi:10.1187/cbe.14-01-0004. Ballen, C. J., Blum, J. E., Brownell, S., Hebert, S., Hewlett, J., Klein, J. R., … Cotner, S. (2017). A call to develop course-based undergraduate research experiences (CUREs) for nonmajors courses. CBE Life Sciences Education, 16(2), mr2. doi:10.1187/cbe.16-12-0352. Brownell, S. E., Kloser, M. J., Pukami, T., & Shavelson, R. (2012). Undergraduate biology lab courses: Comparing the impact of traditionally based “cookbook” and authentic research-based courses on student lab experiences. Journal of College Science Teaching, 41(4), 36-45. Hooser, E. A., Bilinkski, T. M., & Baynham, P. J. (2018). Implementing a course-based undergraduate research experience in an introductory biology course. In N. H. Hensel (Ed. ), Course-based undergraduate research: Education equity and high-impact practice (pp. 127-138). Sterling, Virginia: Stylus. Kveven, A. (2018). Diving into research at the ocean research college academy. In N. H. Hensel (Ed. ), Course-based undergraduate research: Education equity and high-impact practice (pp. 87-98). Sterling, Virginia: Stylus. Linn, M. C., Palmer, E., Baranger, A., Gerard, E., & Stone, E. (2015). Undergraduate research experiences: Impacts and opportunities. Science, 347(6222). Ross, J. L., Atkins Elliott, L., Bur, S. K., Gilbertson, J. D., Kosenkov, D., & Sigmann, S. B. (2018). Continuum of labs. In R. Waterman & J. Heemstra (Eds. ), Expanding the CURE model: Course-based undergraduate research experience (pp. 29-59). Tucson, AZ: Research Corporation for Science Advancement. Russell, S. H., Hancock, M. P., & McCullough, J. (2007). Benefits of undergraduate research experiences. Science, 316(5824), 548.